We’ve facilitated close to 100 strategy days and, while they all have a similar theme, none are exactly the same. 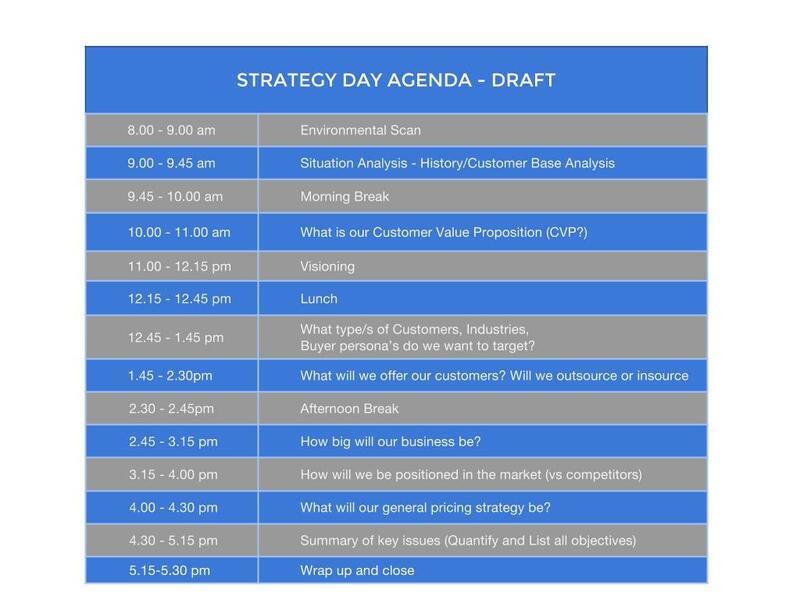 Getting your strategy day agenda right is critical. 1) What is winning to us? 2) Where will we play? 3) How will we win? 4) What do we need to win? 5) What systems do we need? There isn’t an absolute right or wrong way to put a strategy day agenda together. The agenda below works very well as long as all participants understand the purpose of each session. There is a great deal of inter-dependency between the sessions and there is nothing wrong with changing the order or timing. For example, you may wish to discuss your target market, positioning or other strategic issues before you settle on the vision or value proposition. A review of your external environment needs to be a key part of your strategy day agenda. Strategic thinking in this context is about identifying, considering and understanding possible future operating environments for your organisation. You can then think about the possible options you have in front of you for your business. This way you can position your organisation for advantage in its external environment. Situation analysis marries the insight from the external environment to the strengths and weaknesses inside your organisation. The traditional way of doing this is by using a SWOT analysis and then a TOWS analysis - two great explanations here from Mindtools. Breaks are a must. Forget them (and the food and coffee) at your peril. What is our customer value proposition? How are we different in a way that matters to the people we want to matter to? I’d marry this exercise with competitor analysis using the three circles exercise to help you understand where your advantage is. Vision - What do we want to build? The objective is to define where or what your 'point B' is. Where are you now (Point A) and where are you going (Point B)? Management might come to the session with a predetermined future it wants to achieve. Or the strategy day agenda could include a collective discussion about where the business needs to go. Regardless, it’s important to get your Point B sorted out. A great exercise for doing this is the On the Cover visioning exercise. A light lunch is best. You don't want people feeling sleepy in the afternoon sessions! What customers do we want? What industries do we want to be in? Our target market. Defining the target market is a critical component of the strategy day agenda. Start by defining the kind of clients you want to work with. This is about the characteristics they should have to fit your ideal profile. Note: your ideal customer will change as your business changes. For example we’ve recently become a Hubspot Partner Agency which means our ideal client no longer needs to have their head office in Australia. Once you’ve established the kind of clients you want, you or your marketing team will then need to develop individual buyer personas for each target audience. This is to ensure you connect with the right people in the right organisations. What will we offer our customers? What value? What will be insourced and outsourced? Services! To win you need to leverage your strengths to offer the right people a level of value that's better than the competitors. To be able to optimise that value you need to understand those people and what their pains are. This is about looking inward to what you do well and outward to what the client wants and needs. And outward to what competitors are doing and how you can position relative to them to offer a better alternative. Look at the time horizon as you’re doing this as well. What have you done in past that’s got you wins? What are you doing now that’s working? What do you need to do in the future? What technologies do you need to adopt to stay competitive? And keep and eye on your competitors. Take one, you need to give your brain a break. How big or small do we want the business to be? And by when? I call this the Point B thinking. Arguably, this could be part of your visioning work. Some businesses actually like to pull this out and focus on business size as a separate part of their strategy. Are we small and flexible? Are we large and offer less risk? Do we use a distributed model and pull specialist teams teams together for each project? Have you considered all the options? For example, being small doesn’t mean being under resourced. Availability of collaborative technology like Slack or Google Hangouts and work collaboration tools like ASANA or Teamwork means you can win by having a great, flexible team that's distributed globally. What does ‘big’ or ‘small’ mean? Is it still relevant? How should we position relative to our competitors? No strategy day agenda is complete without market positioning. Positioning is relative. It is about how you are different (to your competitors) in a way that matters to the people you wish to matter to. Positioning is about leveraging what and how you do things so it's perceived as being more valuable to your target markets than the competitors. Think of the way Apple positions relative to Microsoft, Virgin relative to Qantas, Lexus relative to Mercedes and BMW or Officeworks relative to Staples. How are you going to leverage everything that makes your business different and more valuable to your target buyers than the competitors? What’s our general pricing structure? Pricing is the the way you define in dollar terms the value of the services you offer. It's an often forgotten piece of the strategy day agenda, but it's a critical piece of the strategy process. Pricing reflects your position strategy, the vision, type of customers you're targeting and how you are going to position in the market relative to the competition. To develop your pricing strategy take into consideration your own value (and required profitability), the value to the customer and the alternatives being offered by the competition. Pull it all together on a page and summarise the key issues you need to address. There will always be issues. 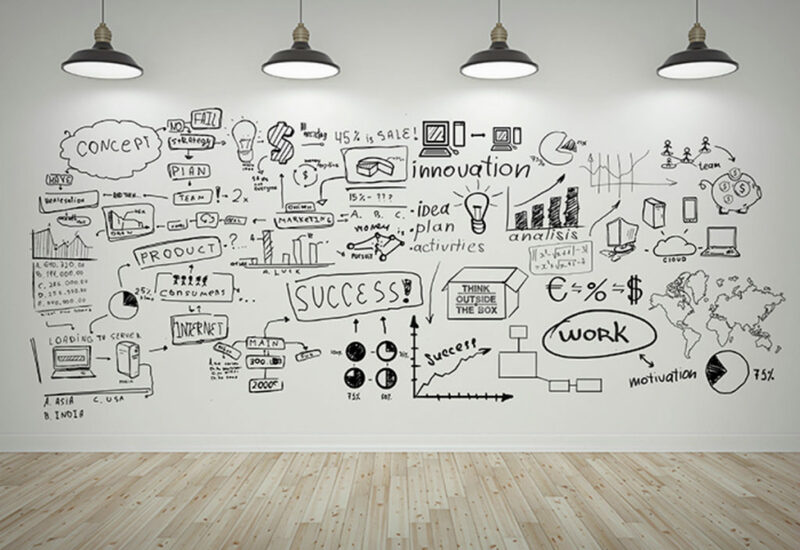 Your job in the strategy session is to identify which issues are of strategic importance and are going to hinder (or accelerate if solved) you getting to your strategic goals. We compile a simple list and undertake ‘dot-voting’ to ensure everyone is focusing on the right issues. Quantify and list the key objectives that will get you to you where you need to be. For SME’s I suggest limiting this to no more than 5-7 key objectives. Any more than this is often difficult to manage. Then establish the next steps - develop a roadmap to 'get there'. This is where we leave strategy and move into strategic planning. Who does what, when, where and how. This can be as simple or as complicated as you like. The key to success is to assign responsibility, time and KPI’s to each of the key objectives. At the strategy level a good way to do this is via a simple roadmapping matrix that lists the key objectives and then breaks each into a series of top level actions that need to be undertaken to realise the objective. This is a simple overview planning exercise that can help the team link strategy to action for further development after the strategy day. Your strategy day agenda doesn't need to be complicated. It can be simple as long as it includes the key areas you need to focus on.